Our wedding hair specialists at our Plymouth hair salon can create a beautiful, custom look for one of the most special days of your life. 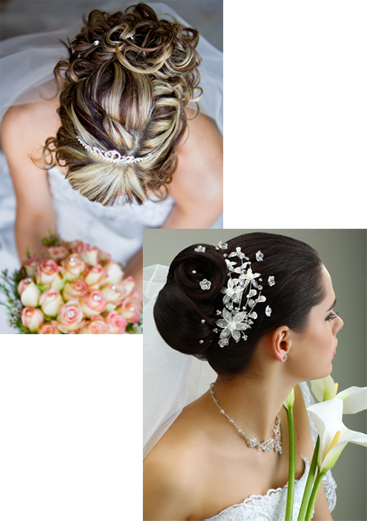 We will ensure that your hair is absolutely stunning on your wedding day. From elegant, and ornate updos to long flowing curls, we can create the perfect hairstyle that will leave you stunning. Schedule an appointment with our talented hair stylists and makeup experts. During your personal consultation, you may bring photos of your dress, your color scheme and hairstyles that you like, as well as your veil or any hair accessories. In addition to professional wedding hair services, we also have a full menu of nail services that will pamper and refresh you before the big day! Our manicures and pedicures along with our professional makeup services will add the finishing touch to your bridal look! Do I need to schedule a trial run for my wedding hairstyle? Yes. A trial run for your wedding hair is very important. It is one of the best ways to avoid stress on your wedding day. This will allow you to see a practice version of your hair, and give your hair stylist a chance to make any adjustments. We recommend that you schedule an appointment at our hair salon 2 to 3 months in advance. What should I wear to my wedding hair appointment? When you arrive at our hair salon for your trial run or final appointment, remember to wear a button up shirt. Collared shirts, or turtlenecks can ruin your bridal hair, so it is best to avoid wearing these. What should I bring to my initial wedding hair consultation? At your first wedding hair appointment you can bring any photos that you have to show different wedding hairstyles that you are interested in, as well as photos of your dress. We can discuss different hairstyles that will work beautifully with the type of veil or hair accessories that you have chosen. We will be happy to share options for different wedding hairstyles that will work well in outdoor settings where the weather can be unpredictable.